James Cook University scientists have helped invent a clever technique to tell black leopards apart – a trick that may end up saving their skins. Scientists from JCU in Australia and others have been studying the leopards on the Malay Peninsula – where almost all of the big cats are jet black. Experts have no idea why the leopards are black and, until recently, could not tell them apart, hindering research and conservation efforts. But researchers have now devised a simple method to solve the problem by manipulating the mechanism of automatic cameras. 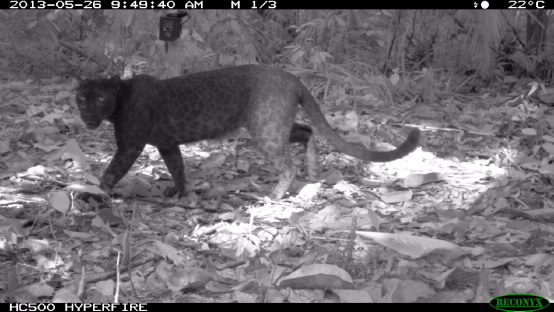 The researchers want to use their new method to study black leopards in other parts of Peninsular Malaysia where there is abundant prey but few leopards to be seen. It’s thought widespread poaching is to blame. “Many dead leopards bearing injuries inflicted by wire snares have been discovered in Malaysia,” said Distinguished Professor William Laurance from James Cook University. He said that leopard skins and body parts are increasingly showing up in wildlife trading markets in places such as on the Myanmar-China border. Leopards, found from the frozen forests of Russia to the scorching sands of the Kalahari Desert, are the most widely distributed large cat on earth. Their iconic spotted coat has been admired and coveted by humans for millennia. The black leopards of Peninsular Malaysia are extremely rare. “This is perhaps the only known example of a wild mammal with virtually an entire population composed of black individuals,” said Laurie Hedges. Black coloration—also known as ‘melanism’—is found in some mammal species, especially big cats, where individuals that normally have patterns or colours in their coat are instead completely black. However, scientists have no idea why it predominates in the Malay Peninsula.